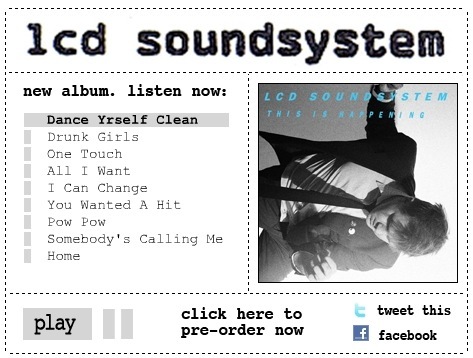 I didn’t think that I could love LCD Soundsytem more, and yet it turns out that I can. Simple little post here. Basically, this new record sounds great. James Murphy & co are back, and awesomer than even before. Best, to pre-empt illegal downloads, there is a heft preview of the new record, “This Is Happening” on their site here. Click! Listen! Fall deeper in love. If you love it too, buy this jam when it comes out and support your favorite artists so they can keep making awesome. This entry was posted in Stuff I Like, What I'm listening to and tagged awesome, free music, fun, james murphy, lcd soundsystem, new music, New releases, this is happening by strawberryluna. Bookmark the permalink.